Thor's gonna need a ton of thunder-power to even touch this thing. We're all familiar with the Antichrist—the Dark Messiah of the forces of evil, destined to lead the Legions of Hell at the end of the world. He's suave, he's clever, and represents the very worst that humanity has to offer. This guy is a little different. Whereas the Antichrist is a monster in human form, the Beast of the Apocalypse is a literal monster, who also happens to be a harbinger of the end times. This is the kind of beast who gives the gods themselves nightmares, and in action it's liable to be a veritable engine of destruction, trampling over mortals, gods, and anything else that gets in his way. If this thing slips its leash you may as well turn out the lights and lock the universe behind you when you go, because there won't be much left. Even if this isn't the case, the simple fact of this creature's appearance means that things are about to get a whole lot worse. For obvious reasons, such a creature is very likely to be a case of Sealed Evil in a Can. It is liable to overlap with Kill the God and Omnicidal Maniac, and will feature prominently in any Götterdämmerung. May be an Enemy to All Living Things. Compare Destroyer Deity. See also Eldritch Abomination as well as its variants, Humanoid Abomination and Animalistic Abomination, which can all overlap with this. Digimon Tamers: Megidramon i.e what happens when Takato, in the brink of extreme anger after Beelzemon killed Leomon, forced Guilmon to evolve to Mega-level can cause the slow collapse of the Digital World simply by existing. Fortunately Jeri managed to bring him and Takato back to their senses, and Megidramon devolved back to Guilmon. In Berserk, this is the role Emperor Ganishka plays in the Prophecy of the Hawk of Light, particularly once he transforms into Shiva. In a rather cruel twist, he is actually opposed to The Antichrist figure, Griffith, who slays Ganishka to deceive the people of the world into following him. Depending on how you class demons, Hellboy himself is either this or the Antichrist. Much of the imagery associated with him is taken from descriptions of the Beast in Revelations. The Ogdru-Jahad aka The Seven Who Are One, representing the Dragon of Revelations, are definitely this, as are their 369 children, the Ogdru-Hem, who seek to free their parents so that they might reduce the planet to a smoldering cinder. The Conqueror Worm, a Lovecraftian being summoned by Hermann von Klempt as part of his plan to unleash the Ogdru-Jahad, is also an example. Created by allowing a being from the void between the stars to infest the body of a dead Nazi rocket scientist, the Worm will transform all of humanity into their final, reptilian state, and then devour them, causing so much death and destruction that the Ogdru-Hem and then the Ogdru-Jahad will awaken and burn the world. Used in an oddly technopunk style in East of West where Death's son is raised to be the beast of the apocalypse. However the three horsemen (there are three because Death no longer works with them) have their doubts as to who the beast really is. Incredible Hulk: In the Planet Hulk storyline, some of the inhabitants of planet Sakaar believe "The Green Scar" to be their prophesised saviour Sakaarson, and others a demonic being called the Worldbreaker. Initially the latter title seems to be metaphorical and referring to more of an Anti Christ figure... until both Hulk and Banner become so angry that for the first time in his life the Hulk crosses the line into Tranquil Fury, at which point it becomes horrifyingly literal. Played for laughs in Ghostbusters (1984), when Ivo Shandor's machinations summon the prophesied demon Gozer to destroy the world because "humanity is too sick to live". Gozer proceeds to take the shape of a giant Stay Puft Marshmallow Man and lay waste to the city before being banished back to where it came from. Faust: Love of the Damned: The Homunculus is a giant serpent demon who will bring about Hell on Earth. Holocaust 2000: Played with. Robert has an apocalyptic nightmare featuring the seven-headed Beast from the Sea from the Book of Revelation. However, this actually symbolizes the seven-towered nuclear power plant he is working on. The Beast of the Rakans in Reflections of Eterna. Up to this point it has never appeared, but it is referenced in terms of dread in almost every book. Despite being an angelic being, the Abomination of Desolation is played up as this in The Fallen, with its goal being severing Earth from Heaven, followed by destroying the world. It's not evil, though, just literally made for that purpose. The Beast of Judgment in The Shadow Campaigns is traditionally considered to have been this; believed to have been an Eldritch Abomination sent by God to destroy a corrupt world, the beast was defeated by the local Crystal Dragon Jesus who banished it with his Incorruptible Pure Pureness. The Sworn Church teaches that humanity must stay on the righteous path or God might decide to summon the Beast back for another try. Religious art usually depicts it as a giant wolf-like monster, though this is accepted as being a metaphor. The actual Beast - a rare, fully-sapient demon that can possess seemingly limitless human hosts and wants to pull an Assimilation Plot on the world, currently stuck in a single body in the Church's dungeon - is much more frightening. The Fikos from Tailchaser's Song is this. It appears at the end of the book and it's a sign that all hell has gone loose. It's a vaguely dog-like Body of Bodies created by Hearteater. It's defeated off-screen after Tailchaser passes out. The Beast on Angel, a huge, horned monster made out of rock, and prophesied to bring about an apocalypse. It's eventually revealed to be The Dragon to the season's real Big Bad, Jasmine, though this does little to detract from its status as an example of the trope. Supergirl (2015): Ancient Kryptonian mythology speaks of the Worldkiller. First, she leaves her mark (it resembles the House of El symbol, but with the "S" replaced with a skull) all over. Second, she kills all sinners. Third, she destroys the world. The genetically engineered being Reign was modeled after the story of the Worldkiller. She proves much more powerful than the average Kryptonian, beating Supergirl to a bloody pulp in their first battle. In the series finale of Ash vs. Evil Dead, the Dark Ones kickstart The End of the World as We Know It by summoning Kandar the Destroyer, a massive demon whose only purpose is to destroy everything. And worse, any attempts to stop him with conventional weaponry just makes him stronger. The Beast from the Sea, a.k.a. the First Beast, or the Beast, from the Book of Revelation, a seven-headed, ten-horned monstrosity who represents the Devil/the Dragon on Earth and wields all of his authority. Having been healed of a fatal wound it seems undefeatable. There is also the Second Beast, a.k.a. the False Prophet, a ram-horned, dragon-voiced being who serves as propaganda minister to the First Beast. One could argue that Satan himself, in the form of the Dragon, is also an example. Islam has a similar concept in the Beast of the Last Days. Fenrir, also called the Fenris Wolf, and Jormungandr. Brothers and children of Loki, the two were imprisoned because of their prophesied role in Ragnarok. It doesn't work. When the end times do roll around, Fenrir is freed (when his sons, Skoll and Hati, devour the Sun and the Moon), and Jormungandr crawls onto land, and the two of them lead the assault on Asgard, where they batter down the gates and slay Odin and Thor respectively. 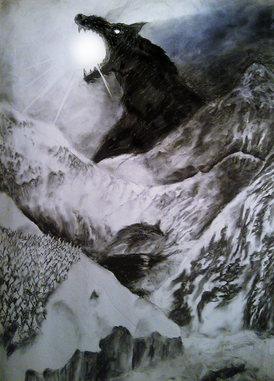 By this point Fenrir is so large that his upper jaw hits the sky when he opens his mouth, Jormungandr can encircle the world, and the din they create is so loud that it causes the sky to split open, freeing Surtr and the sons of Muspel to make war on the gods. One could make a case for Nidhoggr, an Omnicidal Maniac of a dragon who gnaws away at the roots of Yggdrasil with the intent of undoing all creation. Classical Mythology: Typhon, the worst monster in Greek myth, is a failed Beast of the Apocalypse. Following Zeus' defeat of Cronos, Gaia slept with Tartarus in order to conceive Typhon, whom she then turns loose with the intent that he kill the Olympian pantheon and continue the pattern of succession within Greek myth. He fails and is imprisoned by Zeus. Whether he can break loose is never really explored. Egyptian Mythology: Apep, the Lord of Chaos, was a monstrous serpent said to have come to life immediately after the birth of Ra, arising from the sun god's own animated, undead umbilical cord. The two deities waged war every night when Ra took the Sun into the Underworld to rejuvenate it, with Apep attempting to destroy it and Ra. Ra would be protected by other gods, or battle the serpent himself while in the form of a cat. If Apep were ever to win — which could theoretically happen every time the sun went down — he would devour both Ra and the Sun, and the world would end. Rovagug, the Rough Beast, God of Wrath, Disaster and Destruction. Crawling from a sinkhole at the edge of the universe, Rovagug embodies omnicidal mania, and seeks to devour all of the gods and the very fabric of reality itself. For this reason, all of the gods allied in the distant past to chain him in the center of Golarion. The Archangel Sarenrae threw him down, while the Archdevil Asmodeus forged his prison and the key to his cell. Rovagug is constantly straining to free himself, and it would be a very bad thing if that were ever to happen. In Pathfinder' Space Opera spin-off Starfinder, the planet Golarion has disappeared for unknown reasons, and consequently so has Rovagug's cell. As a result, no one knows where in the universe Rovagug is, and this makes a lot of gods and people very worried indeed. Rovagug's Spawn are played very similarly; what he can do to the universe they threaten to do to the world, ploughing through armies and entire civilizations. Than again, with names like "Festering Ulunat, the Unholy First", "Great Doom Chemnosit, the Monarch Worm", "the Tarrasque: Armageddon Engine", "Unyielding Kothogaz, the Dance of Disharmony", "Wrath-Blazing Xoanti, the Firebleeder", and "Volnagur the End-Singer" this isn't exactly surprising. The Tarrasque was portrayed this way (an immensely powerful monster designed for "epic" level play, which can only be killed by slaying it and then asking a god to intervene and finish it off for you). Its considerable power was later eclipsed by other publications, particularly the Epic Level Handbook, which introduced monsters many orders of magnitude more dangerous. The Elder Evils book is completely themed around this trope, each chapter providing one or more such creatures and providing some rules and storylines for employing them. Dendar the Night Serpent in the Forgotten Realms setting an enormous black snake that came into existence when the first being slept and had a nightmare. At some point in the future, Dendar is destined to invade Toril, where she will do battle with the god Ubtao at the Peaks of Flame; if Ubtao loses the fight, Dendar will devour the sun and bring about the end of the realms. The Antediluvians from Vampire: The Masquerade, ancient vampires that have grown so powerful and monstrous that their awakening would lead to Gehenna, the vampiric apocaylpse. In the Gamecube entry of Custom Robo, Rahu, the final boss is this: An entity whose only goal is to cause destruction and grow stronger. Once an invisible organic being that attacked the Earth and then entered a deep slumber multiple times, growing stronger and evolving after each attempt. When it became trapped inside a child's toy it became vulnerable, which led to its defeat but even then, he managed to leave most of the Earth unhabitable AND he still survived. The government's plan consists in destroying him for good before he can destroy the last living terrain on Earth. Thankfully, at the end of the game he is Killed Off for Real. In The Legend of Spyro, Malefor's plan to take over the world involves waking a massive, ancient golem named "The Destroyer". Chrono Trigger's Lavos, an Eldritch Abomination from outer space that has fallen onto the planet where the game takes place in prehistoric times, wiped the dinosaurs and the sentient Lizard Folk, paving the way for human civilization, and has been sleeping under the crust of the planet ever since, absorbing the DNA of the local species to evolve itself and the spawn it creates. Eventually it would break free and move on to a different planet; the game's heroes witness the Bad Future caused by its catastrophic emergence and aim to Retcon it. Typhon is portrayed this way in Titan Quest, although much like his mythological inspiration, he never quite succeeds in clearing out all of Olympus. The Darkova in Odin Sphere (being heavily based in Norse Mythology), the three-headed and six-eyed beast of Armageddon whose role is thematically that of Fenrir and the first of the Five Disasters that must be defeated to save the world from utter destruction. There's also Leventhan, the last dragon, who transforms into the bringer of Chaos during the game's final events. He's modeled in equal parts on Leviathan and Jormungandr while his name is taken from Surtr's sword, Lavatein, and is the last of the Five Disasters the heroes must slay to prevent The End of the World as We Know It. In DragonFable, there are two Dragon Boxes with dragon eggs inside them: The that hatches from the Black Dragon Box will destroy the world, and the one that hatches from the White Dragon Box will save it. The one from the White Dragon Box, Fluffy, is corrupted and turned undead, so the world is doomed, right? Fluffy saves the world by weakening itself after it's forced to gain a lot of power, and the one from the Black Dragon Box destroys a planet... the planet-sized dragon, Fluffy. Solaris, interdimensional lifeform and god of time in Sonic the Hedgehog (2006). Divided into Iblis (the body) and Mephiles (the mind) he seeks to cause the collapse of time itself. BlazBlue has The Black Beast. A monstrosity which wiped out a massive proportion of the human population and polluted the world with seither, meaning the survivors (minus some Beastkin who were created to fight it and can process it naturally) have to live on cities built on mountaintops. It's actually Ragna, doomed to be sent back in time and become a Tragic Monster, until the Stable Time Loop was broken by the existence of Noel. Omega in Mega Man Zero, Ax-Crazy yet loyal Dragon to Dr. Weil. Caused the demise of 75% of all sentient life (combined total of humans and reploids). Making things even more horrifying is that Omega is exactly what Dr. Wily intended Zero to be. Sprinkle a little extra Fridge Horror on there when the reveal is made that Omega is Zero's original body, meaning that Wily succeeded. In The Legend of Zelda, some versions of Ganon fit this, such as the Came Back Wrong mindless Ganon from The Legend of Zelda: Oracle Games and The Legend of Zelda: Breath of the Wild. Alduin the World-Eater, a colossal black dragon and "firstborn" of Akatosh, the God of Time and Top God of the Nine Divines pantheon (or possibly an aspect of Akatosh, as sources conflict on the matter). Alduin's divine mandate is to devour the world at the end of every "kalpa", or cycle of time, to make way for the new world in the next kalpa. As Alduin is the embodiment of the end of the world itself, he can only manifest his full power when it is time to actually end the world, at which point he becomes a titanic monster with divine power even beyond that of the Daedric Princes. However, Alduin doesn't seem particularly interested in fulfilling his purpose. He'd much rather rule the world and be worshiped as a god than destroy it. Since it isn't the appropriate time for him to end the world when he serves as the Big Bad in Skyrim, he is "merely" an invincible dragon who needs a very specific realty-warping Thu'um shout (Dragonrend) to even render him into a state where he can be hurt. Satakal, the Yokudan "God of Everything," is this in Redguard culture (with many parallels to Alduin, prompting speculation that they are the same entity/event seen by two different cultures). Suffering from a great hunger, Satakal consumes the world in order to create another, leaving behind "worldskins" as he does. Ruptga, the "Tall Papa" and chief deity of the Yokudan pantheon, was the first spirit to survive this process and helped to teach others how to survive as well. Those who do typically become additional deities in the Yokudan pantheon. "Weaker" spirits, like those of the mortals within Mundus, hope to make it to the "Far Shores," a safe haven from Satakal. The Adephagos of Tales of Vesperia is an ancient being said to have threatened the world in ages past but was sealed away before it could succeed. It is depicted as a writhing mass of tentacled darkness. When Alexei activates Zaude and frees it, it covers the sky, turning it an eerie violet shade with the only things visible on it being a number of phantasmal tentacles seemingly made of living aer. Fate/Grand Order has the seven Evils of Humanity, who all manifest under the Beast class. Each of them is capable of bringing about the End of the World as We Know It by themselves and the appearance of one generally means that multiple Godzilla Thresholds will need to be crossed to bring them down. While their forms and nature vary, a few of them are literal beasts of armageddon. The first of the Beasts the heroes encounter is Beast II, aka Tiamat, the Mesopotamian goddess of chaos, who wants to return all life on Earth back to its primordial state. Her mindset is utterly alien to humans and her mentality runs solely on three things: Wanting to be the mother of all life again, slaughtering humanity and anything that can stop her from achieving that, and subconsciously holding back her full power because on some level she still loves humanity as a mother does, so she limits herself to "just" throwing her monsters and Chaos Tide rather than using her own physical power as much as possible. Beast IV is none other than Fou, the little magical animal that accompanies the heroes on their adventures. As it turns out, Fou is a premature form of Primate Murder, a monster whose entire purpose is to slaughter all of humanity. Thankfully, Fou's time with the heroes has caused him to undergo a HeelFace Turn before maturing, and he sacrifices his future power for the sake of resurrecting Mash, effectively putting an end to Primate Murder before it even appears. Beast VI is the Beast of Revelations itself, who Arthur Pendragon has been hunting across the multiverse after failing to finish it off for good in Fate/Prototype. The Snarl in The Order of the Stick is the result of the Gods' constant disagreements during their first attempt at creating the world that lead to the formation of a beast made of all the snarled threads of reality. It then killed an entire Pantheon without breaking a sweat and urged the remaining Gods to re-create the world after agreeing to add new features in turn to not repeat the mistake and imprison the Snarl into it. The Snarl since tried to break its prison, creating rifts in the fabric of reality that got sealed behind gates by a group of adventurers known as the Order of the Scribble. After Xykon's attempt to control the gates led the Order of the Stick to destroy several of them, the Snarl becomes a threat to reality once again. In Bravest Warriors the Aeon Worm. Beth's father escapes and uses his sticker pet device to try and summon it. Toyed with, like everything else is, in The Salvation War. The Beasts of Revelation are unleashed by Yahweh and Satan with the intent that they end the world... and are cut down by the human military, albeit with more difficulty than most of the demons they've faced up to that point. The Archangel Roxanne has one eternal, unkillable enemy: Therion, The Beast from the Pit, the Seven-Headed Dragon, the King of Demons. He appears on worlds across the multiverse, single-handedly causes apocalypses, and then either moves on or is captured by Roxanne and imprisoned on their homeworld of New Jerusalem, until he gathers his strength and breaks free again.